A graduate from Loyola University Chicago, Yasser Abdullah earned a B.B.A in Accounting & Economics. During his senior Yasser started a construction team that developed into a real estate development group focusing on the Chicago market. 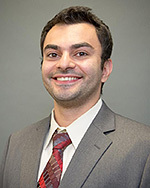 Pursuing his interest in business Yasser attended the University of Chicago Booth School of Business graduating in 2014 with an M.B.A concentrating in Economics, Entrepreneurship, and Strategic Management. After graduation, Yasser continued in the real estate industry managing a self-started real estate portfolio. At Chicago Kent, Yasser is currently serving as the Vice President of the newly founded tax law society and intends to pursue tax law. As a real estate broker at Millennium Realty & Brokerage, Inc., Yasser plans to pursue his passion in real estate after law school. In 2015, Yasser became a Certified Public Accountant and is currently serving as the financial officer for an international pharmaceutical engineering firm.